How good are we at piano moving? At Careful Movers we can tackle all your piano moving needs. We provide specialty piano moving services such as Seattle piano moving. And not just Seattle -- we also offer piano moving services in surrounding cities like Bellevue, Kirkland, Lynnwood, Everett, Edmonds, and the Greater Puget Sound. Moving a piano takes precision and attention to detail, and Careful Movers has to be on target with every piano we move. Your piano is important to you! It's also important that we stand out as piano movers. On moving day, we'll carefully wrap and protect your piano, and then just as carefully load your piano on to one of our trucks and take it to your new location, or to storage. If you're interested in piano storage, we have storage plans offering the first month FREE (with a 12 month contract). We have a large, secure and heated storage facility on Highway 99 just north of Seattle where we store many pianos for customers. On the eastside, we offer piano moving in Bellevue, Kirkland, Woodinville, Renton, Issaquah, Fall City, Snoqualmie, and North Bend. We also offer piano moving to residents north of Seattle, in Bothell, Everett, Lynnwood, Marysville, Lake Stevens, Snohomish and Mount Vernon. South of Seattle, we offer piano moving to Sea-Tac, Tukwila, Federal Way, Auburn, Puyallup, Olympia and Tacoma. Don't live anywhere near Seattle, but need piano moving services? 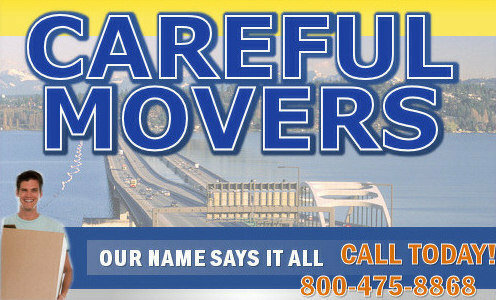 Careful Movers services small towns and cities all over the State of Washington. Even if you don't live anywhere near Seattle, we can still help you with your piano moving and storage. Fill out our online form for a quote or call our experienced office staff if you have any questions: Toll Free: (800) 475-8868.